In recent years, Nepal has experienced much violence that is closely related to climate change and regime change. Nepal is highly prone to natural disasters which have been more frequently occurred due to the impacts of climate change. The 2008 flood especially generated numerous refugees who have spilled over into many communities located in Terai, where many Maoist rebel groups are staying. Nepal had a ten-year long civil war from 1996 to 2006 and has newly become a republic after the long-established monarchy. Newly emerged government has not been effectively control the political conflict generated by the rebel groups and resource conflict by flood refugees in Terai. Nepal is one of the eight South Asian countries. South Asia, the world's second most populous region, is known to be highly vulnerable to climate change. "The high rates of population growth, and natural resource degradation, with continuing high rates of poverty and food insecurity" have contributed to the vulnerability of South Asia to the impact of climate change (Lal et al. 15). Therefore Nepal is one of the countries that are highly exposed to the climate change-induced conflicts. the “Terai” in the south. 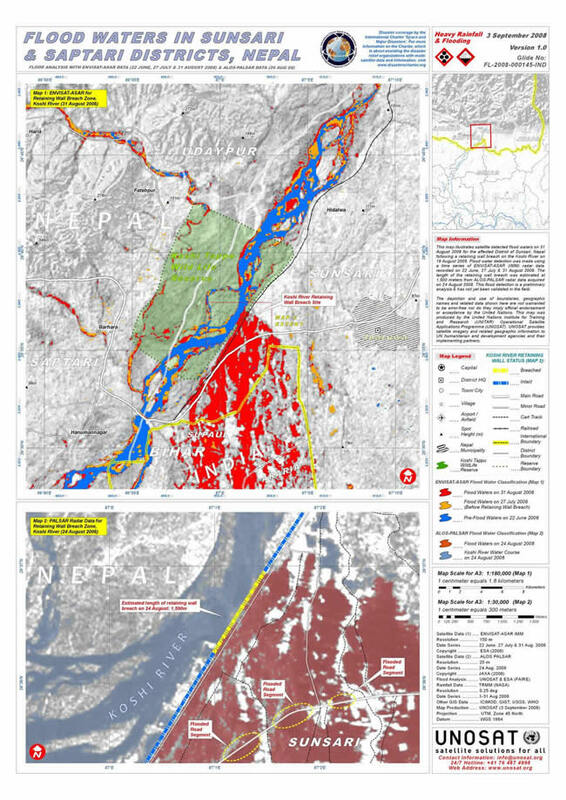 Terai is a land that is low-lying and “highly prone to hydrological disasters” (GRIP 1). along with "a combination of rough topography, steep slopes, active seismic zone and intense impact of monsoon rain" (GRIP 2). 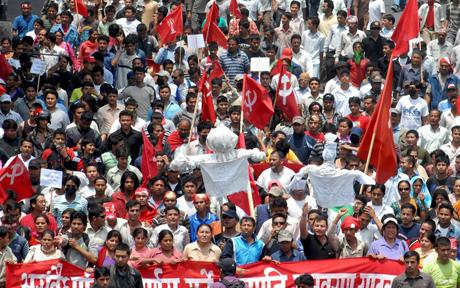 The Jan Andolan, People's pro-democracy Movement gained momentum after the unification between the various political parties from the 1990s in Nepal (BIPPI, "Nepalese Civil War"). This pro-democracy movement aimed to eliminate the Panchayat system, which was a political system of Nepal that was effective from 1962 until 1990. Jan Andolan also forced King Birendra Bir Bikram Shah Dev to resign from his claim to the throne and abolish the long-standing absolute monarchy. So during the early 1990s, various political parties, such as the United Left Front and even the Nepali Congress, joined one another to create an effective coalition. The Communist Party of Nepal (Unified Marxist-Leninist) was formed from this unity (BIPPI, "Nepalese Civil War"). In 1994, the Communist Party of Nepal (Maoist), also known as Prachanda, was founded. Subsequently the CPN-M created the Communist Party of Nepal (Unity Centre) as well. monarchy, using violence to achieve their goal. During 2000s, the Maoist insurgency widely spread to more than half of Nepal's 75 districts (BIPPI, "Nepalese Civil War"), and the violent conflicts resulted in many civilian and military deaths. Violence escalated even more as the government brought in the additional army to national police forces that have been combating the Maoist rebels. CPN-M took two-thirds of Nepal under control by the year 2001 (BIPPI, "Nepalese Civil War"). In the July of that year, the Prime Minister Sher Bahadur Deuba ordered an army ceasefire in an attempt to dialogue with the Maoist rebels who agreed at first but broke the cease fire only few months later in November. By 2003, the Maoist rebels were active "in 72 of Nepal’s 75 administrative districts" (BIPPI, "Nepalese Civil War"). Violent conflicts including "mass strikes, riots, kidnappings, blockades, terrorist bombings" between rebels and the national army were prevalent in Nepal. In the beginning of 2005, the King declared a state of emergency. Meanwhile, the Seven Party Alliance (SPA) was organized to oppose the royal takeover. The fighting began to decrease as CPN-M and SPA held a joint conference in India, issuing a "12-point understanding," a framework in which the rebels demanded democracy and freedom of speech (BIPPI, "Nepalese Civil War"). The joint organized a massive uprising and thousands of people came out to the streets and demanded the king to resign from his power. Violent clashes between the government and the rebels continued, and finally in 2006, both the rebels and the government came to an agreement on the arms accountability (BIPPI, "Nepalese Civil War"). On November 21, 2006, the Comprehensive Peace Accord (CPA) between Maoist leader Prachanda and Prime Minister Koirala was made. Nepal became a republic by abolishing the monarchy on 28 May in 2008. Immediately a day after, hundreds of Nepali protesters demanded the dethroned King, Gyanendra to leave his place and there were clashes between the protestors and the police. The Maoists won over one thirds in the 601-member assembly in election of 2008 (The New York Times, "The kingdom is dead, Nepal's republic is born"). Approximately 13,000 people have died from the ten years of civil war (Tamang 4). Over 4,000 killed by Maoist rebels and 8,200 by the government army (BIPPI, "Nepalese Civil War"). The Nepal government has revised the official death toll to be 16, 278, increasing the previously announced death toll by more than 3, 000 (Agence France Presse, "Nepal Government Raises War Death Toll"). Nepal is prone to natural disasters and vulnerable to climate change. Nepal’s climate change vulnerability is closely related with its geography (Smith and Vivekananda 15). 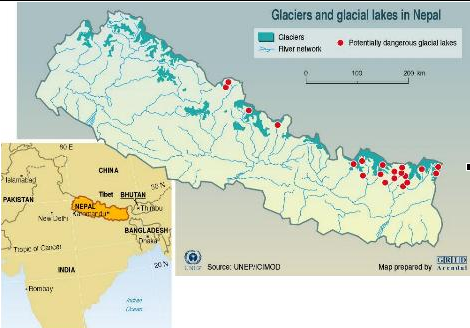 Global climate change has tremendously disrupted the South Asian monsoon cycle and also increased the rate of glacier melting of the Himalayas (Regmi and Bhandari 43). The climate change in Nepal has contributed to the rise of the violent conflicts among the communities that especially suffer the recurring natural disasters. Terai region of Nepal is especially vulnerable, along with the fact that almost 50% of the population is concentrated in this area (CIA Factbook 2013). 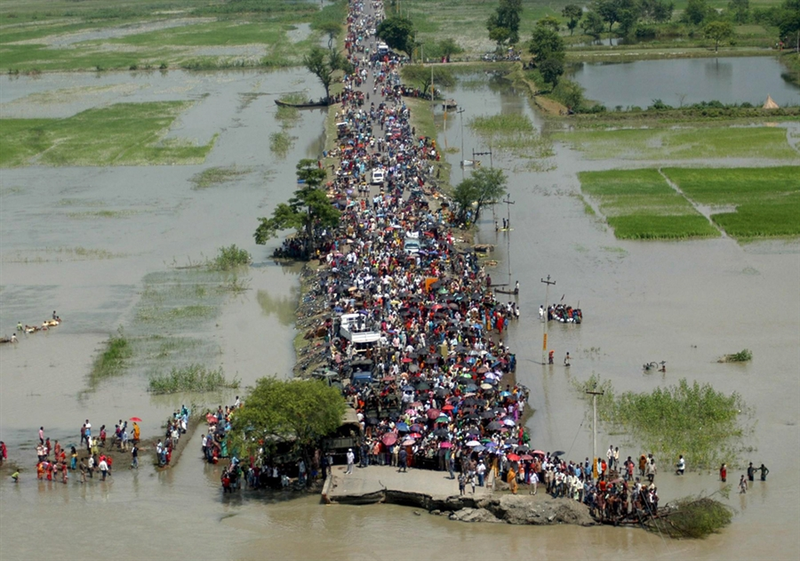 In the summer of 2008, the flood that resulted in killing 240 people and displacing 60,000 people broke out in the Terai region in Southern Nepal (Vivekananda 8). The flooding of the Koshi River was already foreseen, as earlier that year, the Indian firm that was contracted to repair the Koshi River barrage, failed to carry out their service as there was great tension between political parties and armed groups (Smith and Vivekananda 18). The dislocation of flood refugees into the neighboring communities were already experiencing conflict among themselves inevitably resulted in conflicts (Vivekananda 8). The influx of flood refugees created tension between the host communities and the refugees. Therefore, a demand for a desperate governmental assistance arose as the refugees were not having clean water and shelters for themselves (Vivekananda 8). Yet, the Nepal government’s incapability to prevent the flood due to difficulties in climate financing (Regmi and Bhandari 5) and inability to dissolve the tension between political groups and armed groups (that were remained to be active after the decade-long Nepal Civil War) greatly hindered giving the necessary provisions to the refugees and the host communities. Terai, Nepal is known as one of the most vulnerable regions to climate change.The increased rate of snow-melting on the Himalayas raised the level of Koshi basin, one of the Himalayasnowfed watersheds in the country. Even though flooding of Koshi River in Terai has been predicted, the Nepal government failed to prevent it. The incapacity of the government led to flooding which generated numerous refugees. These flood victims migrated into neighboring communities who were already experiencing conflicts among themselves due to political instability caused by the existence of many armed groups and rivalries between political parties. The conflict between flood refugees and host communities was inevitable, since the influx of the flood victims overwhelmed the available portable water and shelters. This conflict added another burden to already incapable government and the conflict-generating cycle continues. Summer monsoon cycles operate with following factors: “strong radiation from the Sun, strong heating of the land, an inrush of ocean air” (Ruddiman 48). The modern day Indian summer monsoon that visits the South Asia around June each year, usually lasts for three months, providing 90% of the annual rainfall of Central and Western India and Pakistan, as well as other neighboring countries (Fagan 204). The enormous body of warm water that includes the waters of the western equatorial Pacific and some of the Indonesian Archipelago is known as Hot Pool (Fagan 202). Importantly, this Hot Pool is the “crucible for the monsoon climates of Asia and the Indian Ocean” (Fagan 202). Brian Fagan, the author of The Global Warming, explains that “the slow and cyclical fluctuations in the size and temperature of the Hot Pool may be closely linked to the intensity of El Niños” (202). Further, he explains that El Niños makes the Hot Pool move eastward and then a great high-pressure system builds around Indonesia, which eventually “delays the monsoon, drought ensues, and forest fires rage over side areas” (Fagan 202). Therefore, he concludes that there is a “direct and invariable” linkage between El Niños and monsoon failure over South Asia (Fagan 203). Monsoon failure directly affects the agricultural production. Prolonged dry season and frequent droughts also cause agricultural failure and natural disaster refugees. Nepal has been experiencing these issues more frequently in recent years and many literatures and scientific studies suggest that they are induced by climate change. This video shows Julie Pollard, Practical Action's education manager, who explains how climate change is affecting the Nepalese people. Nepal's climate varies, from the tropical to the arctic, because of altitude differences. Nepal has four climatic seasons and between June and August, the weather is most hot and wet. This is also the monsoon season (Visit Nepal "The Best Time to Come to Nepal"). The harm site is where the event occurs, so it is the location noted above. (a) Conflict Harm Location: Terai, Nepal; especially the districts that have directly affected by flood and neighboring communities. In the late 1980s and early 1990s, people of Nepal were beginning to call for democracy, fighting against the 104-year-long Rana regime. The Shah Kings were oppressing the freedom of people and as people demanded their rights and liberties, the tension grew within the nation. In 1991, some Maoist supporters went to the government and requested to discuss about the national political issues and draft a new constitution that would abolish Monarchy. The government rejected and soon the violent war began, formally in 1996. Until its end in 2006, numerous people were killed and became devastated, insecure and poor. Some critics argue that, "the civil war was ended with the initiative and common consensus of the political parties of Nepal without any mediator (Ghimire 3)." Yet civil conflicts continue to remain in some regions like Terai, as 35 armed groups are remained to be active (Smith and Vivekananda 18). The Nepalese government has been struggled with the remainders of the Maoist groups that are mostly residing in Terai region. The ongoing disagreements within the government prevented the Maoist Army to become integrated with the national army (Armed violence in the Terai 1). Such disagreements among various political parties have not helped dealing with the violence in Terai. In the report “Armed violence in the Terai, it was suggested that there are many factors of such violence: “the growth of identity-based politics, a weak state, weak law and order, ineffective policing, high levels of political contestation, political influence over police activities, poor economic opportunities, democratization and weak border controls." (Armed violence in the Terai 2) Climate change-induced migration of flood refugees has also greatly contributed to this violence in Terai. Fig. 4 shows the Sunsari and Saptari districts where have been seriously affected by the 2008 Flood, which resulted in killing 240 people and displacing 60,000 people (Vivekananda 8). The 2008 flood itself created a tremendous devastation to the residents near Koshi river. Flood victims lost their family, houses and properties and had to migrate into the neighboring communities, where the military/political conflicts are ongoing. Those communities have been suffering from the impacts of climate change that resulted in water shortages (Vivekananda 8). Consequently resource scarcity became an issue among the community residents and an influx of numerous flood refugees. The 2008 flood generated numerous refugees and devastated both human and physical capitals. Other than this direct cause, there are many other factors that together formulate the current multifaceted conflict in Nepal. Climate change has become "the single most pressing issue facing society on a global basis, with serious implications for the food security of billions of people in the developing countries" (R. Lal et al 15). Nepal is located in South Asia which is especially known as one of the most densely populated areas. South Asia is also known to be "the most disaster prone region in the world" (R. Lal et al 14). R. Lal et al explain why South Asia is so vulnerable to climate change; the factors such as "the high rates of population growth, and natural resource degradation, with continuing high rates of poverty and food insecurity" make South Asia "one of the most vulnerable regions to the impact of climate change" (15). From the report of the Working Group II chapter on Asia (Chapter 10 – Cruz et al. 2007), it was analyzed that the past and present climate trends in South Asia have been characterized by "increasing air temperature...decreasing annual mean rainfall...and increasing tendency in the intensity and frequency of these events" over the last century (R. Lal et al 17). Rafael Reuveny argues in his article "Climate change-induced migration and violent conflict" that "regions depending relatively more on the environment for livelihood are more likely to exhibit environmental migration"(661). The governmental instability, climate changed-induced migration, the presence of armed groups in Terai which is suffering resource scarcity, intensified monsoon cycle and prolonged dry season will altogether contribute to the continuation of the regional conflict in Terai. in Nepal." TMC Academic Journal, 2012 7 (1): 40-55.
the linkages, shaping effective responses." International Alert. November 2009. Interdisciplinary Analysts, Nepal Madhes Foundation, and Saferworld and Small Arms Survey. Aug. 2011. Web. 22 Apr. 2013. Office for the Coordination of Humanitarian Affairs, 22 Aug. 2008. Web. 22 Apr. 2013. Watch, 2012. Web. 22 Apr. 2013. Watch, 2013. Web. 22 Apr. 2013. Raut, Anil. "Climate Vulnerability and Adaptation in Nepal." The Tiempo Climate Newswatch. Swedish International Development Cooperation Agency., n.d. Web. 22 Apr. 2013. Insight on Conflict. "Nepal: Conflict Profile." Insight on Conflict. Peace Direct, Dec. 2011. Web. Insight on Conflict. " Nepal: Key people and parties." Insight on Conflict. Peace Direct, Dec.
2011. Web. 22 Apr. 2013.